I took a few moments to check out the Frontier Yard today, and with no traffic yet, I started scanning the area with my lower grade binoculars. I looked at the rails nearest me [Old Broadway] and saw one rail dated 1943 [Not mainline rail]. 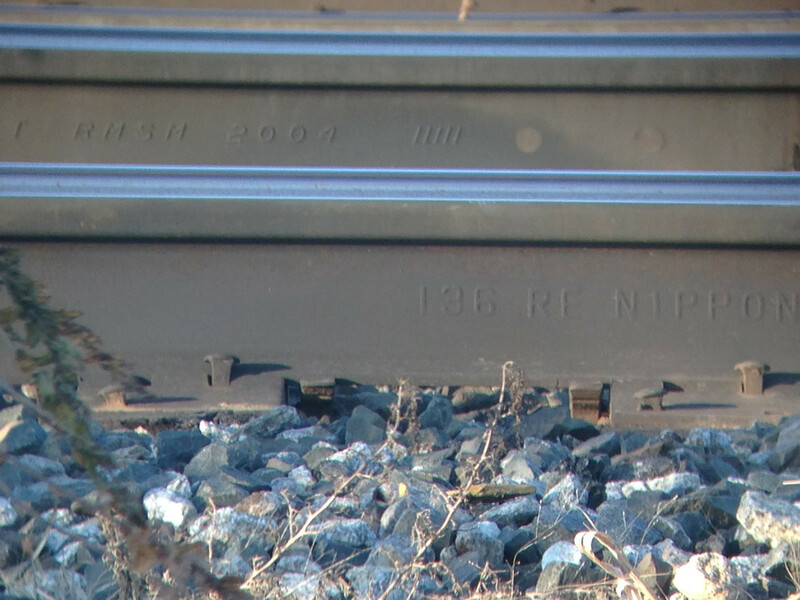 Then I spotted the rail in question, NIPPON. To me that mean Japan. Do we really import foreign rails? We can't even make our own rails anymore? I guess that shouldn't surprise me. Years ago, I needed thumbtacks. Made in China. I was disgusted. While I can understand implementing this new rail, what bothers me is that we are not mfr'g this in our own country. Nothing new, if you think about it. We've manufactured very little in the US for decades. Not too surprising. The old steel mills that made that 1943 rail have long since become antiquated and have been demolished. At around that time, many foreign steel mills had been updated, and were producing superior steels. Also, take into account that UP, being a west-coast railroad, shipping from Asia isn't a big expense. For 30-40 years, US railroads were shrinking and deferring maintenance; today things are starting to change, so let's hope domestic steel manufacturers will start catering to the rail industry better. Really? I'm not sure where you would get that idea. Same can be said for large utility industry generation and transmission class transformers which are now manufactured overseas. I'm not surprised. For my job (not related to RR's) I have visited Japan quite a few times, including some high-tech factories Their attention to painstaking detail on all levels in all aspects is hard to believe. With respect to trains, all of them from subways to the bullet trains are on time to the minute and spotless, with everyone sweating and hustling at all times to get it right - they put even the Swiss to shame. So if there is a difficult step to control in mass production, they will get it right. On the other hand, once they have something set, they change very slowly, even if sometimes for business reasons changing faster would be better. 1943 was wartime. Perhaps after the war, damaged rail lines were wholesale replaced in Japan, and the old rail piled up then picked over by Japanese who needed work & shipped the straight pieces to the US for use in branch lines or yards. This is a total guess. Today Japan has trains that travel at speeds approaching 200 MPH so I would expect if anyone knows how to make rail they do. Perhaps the tariffs on cheap steel that have led to US plant reopenings will lead to more rail made in the US. The lettering is in the Roman alphabet, not in Japanese characters. Clearly made for export if made in Japan. And I am sure the rail, if from Japan, was not made in 1943! My comment on the 1943 rail was a "yard rail." The NIPPON rail was a mainline rail. Different sections of track.